Here at M J Groundwork Service , we have have been providing top quality groundwork services to our clients in Epping, Brentwood, Romford, Chigwell, Theydon Bois, and beyond since we started trading in 2014. Though we have only been in business for four years, our team of highly-trained and professional groundwork experts have been in the industry for over fifty years between them. Before any building project can take place, an investigation of the ground itself needs to be undertaken. This is done to ensure that the ground is stable and suitable for building on prior to beginning construction. It also allows us to identify any potential problems that might hinder the building project later down the line. An essential part of groundwork is clearing anything that is already on the surface. This does not just mean existing buildings or debris, but also the top layer of soil in order to establish a solid base on which to commence building. If the land is sloped, then it may need to be levelled before construction can begin, or retaining walls installed to create a level platform. 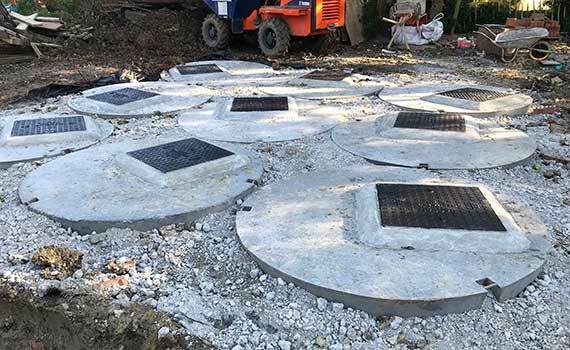 Part of the groundwork we undertake may include the installation of adequate drainage either on a temporary or a permanent basis, depending on how it may affect the structure. Sometimes groundwork does not involve digging down to lay foundations, but remodelling the existing ground into something more pleasing to the customer. Whilst sometimes difficult given the amount of earth to be relocated, the end results are hugely rewarding. Based in Sawbridgeworth, our team of groundwork specialists deliver their services to much of Hertford and Essex, including to our valued customers in Theydon Bois, Chigwell, Romford, Brentwood, and Epping. Whatever your groundwork needs, from drainage and foundations to landscaping and swimming pools, you are guaranteed a high-quality, professional job when you hire M J Groundwork Services. Call us today on 07885 577 899, for your free quote.